The Atherton Gardens HUB Development co-designed by McCabe Architects and Bird de la Coeur Architects has taken away the top honours in the 27th annual Dulux Colour Awards, winning the Grand Prix title along with the Multi Residential Exterior category. The project was praised by the judges for its innovative use of colour in architecture and was commended for how pattern and colour had been successfully combined. 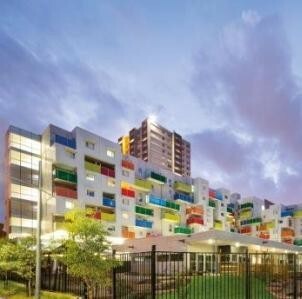 “Atherton Gardens HUB development exhibited exceptional bold use of colour on the external façade of the balconies which in turn created a vibrant impact and strong contrast against the white external walls,” the judging panel said. One of the four judges for this year’s Dulux Colour Awards, Debbie Ryan, a principal of McBride Charles Ryan Architecture and Interior Design said there were similar influences across all projects and categories. “There was an obvious trend in the ambitious use of bright colours and pattern across all categories both exterior and interior this year with many projects exhibiting a strong sense of place and context,” Ryan said. The Grand Prix prize for 2013 includes AUD $1,500 plus airfare, accommodation and entry to an international design fair. Judges believed the project presented a beautiful optimism of a butterfly-like paradise and was further interpreted in a very Australian way. The colourful powder-coated metal created an almost spiritual quality and can be likened to a cathedral. Judges were impressed with the beautiful layering and complete compositional use of colour throughout the project. Playful, peaceful and sophisticated, the colours were pushed to the next level without being overwhelming. Plywood ceilings above successfully tied the space together. The project is a fine example of using bright colours in harmony to create an exciting environment for children without introducing the usual primary colours. Single Residential Interior: Queen St Residence by Edwards Moore Projects Pty. Ltd. Judges commented on the diverse selection of colours used and the injection of personality into the residence by successfully capturing the reflections from bright accents and the use of bright yellow trims, which wash the white walls with colour. The interior architecture was sharp while simultaneously injecting a sense of play into the space. Judges also observed that the upstairs and downstairs areas complemented each other significantly well. Judges were impressed with the subtle, cohesive and sophisticated use of colour which successfully engaged the exterior with its interior. According to the judging panel, the scheme came alive through the use of colours that traditionally wouldn’t be used together. This project shows that with a creative use of colour a heritage space can complement a new modern addition in any home. This project was selected as the category winner for its strong use of vibrant colours. Judges believed it was this ingenious palette of colour that elevated the project from only existing in a realm of mundane and ordinary into a much more exciting, engaging interior space. Judges were impressed with the use of colour, context and contrast to create a space that is community friendly. Dana Tomic Hughes – business owner and editor of interior design blog, Yellowtrace; Adrian Doyle – Melbourne street artist and director of Blender Studios and Melbourne Art Tours; and Denise L’Estrange-Corbet – New Zealand designer and co-founder of fashion label WORLD, joined Debbie Ryan in judging entries in the 27th Dulux Colour Awards. Images courtesy of 2013 Dulux Colour Awards.